Senior City celebrates the 85th birthday of Clint Eastwood on May 31st 2015, in the fourth of a five part series this week. Clint Eastwood became interested in Carmel's local politics and served as the Mayor of Carmel-by-the-Sea from 1986 to 1988. Eastwood bought the Mission Ranch in Carmel-by the-Sea in 1986 and had extensive renovations done to replicate original architectural features and turn it into today's Mission Ranch Hotel and Restaurant (he sometimes plays piano in the restaurant bar). Clint Eastwood and a group of other investors purchased the Pebble Beach Golf Club; Clint occasionally plays golf in charitable tournaments. 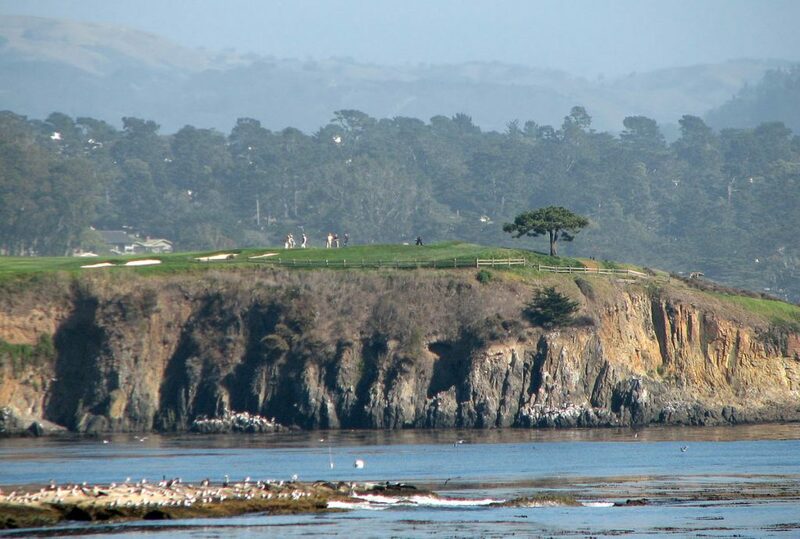 Below, the 6th hole of the Pebble Beach Golf Links. Meanwhile, despite living with Sondra Locke, Clint's had two more children as the result of a highly secret affair with stewardess Jacelyn Reeves - son Scott in 1986 and daughter Kathryn (1988). Both Scott and Kathryn were born in Carmel, but were primarily raised by their mother in Hawaii. Clint Eastwood directed and produced the biography Bird, about jazz musician Charley Parker. 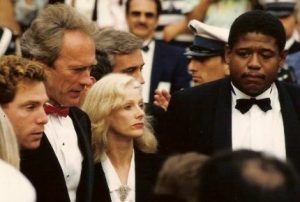 Right, Bird's stars Michael Zelniker and Forest Whitaker flank Clint Eastwood and Sondra Locke at the 1988 Cannes film festival. While living with Sondra Locke in 1988 and filming Pink Cadillac, Clint met actress Frances Fisher and they began dating. By early 1989, Clint and Sondra had argued and were estranged, although Sondra was hoping they would reconcile. In April 1989 while Locke was away filming a movie, Eastwood changed the locks in their home in Bel-Air. Sondra Locke sued Clint Eastwood for palimony and settled out of court in 1990. She sued him again in 1995 because part of the original settlement had included a development deal for her to direct movies at Warner, and it was not being honoured; Eastwood settled with her out of court again. In 1990, a now 60+ Eastwood began living with Frances Fisher. New Clint Eastwood fans and baby boomers loved his 1992 movie Unforgiven, and Clint won his first two Academy Awards - Best Picture and Best Director; he was nominated as Best Actor but didn't win. Their daughter Francesca Eastwood was born in 1993, the same year he met news anchorwoman Dina Ruiz and began to compose songs for some of his movies, beginning with with A Perfect World and the piano compositions for In the Line of Fire. Over the course of the next year Clint and Dina Ruiz met at different events and began dating in 1994, while he was still living with Fisher. Clint became a grandfather for the second time that year when his son Kyle Eastwood had daughter Graylen. Although Frances Fisher and Clint Eastwood split up in early 1995, they are still on good terms. Below, Dina Ruiz, Clint Eastwood, daughter Francesca Eastwood and Frances Fisher at a film premiere. Senior citizen Clint Eastwood married 35-years-younger Dina Ruiz in March 1996 and their daughter Morgan Eastwood was born in December that same year. Dina and Clint's relationship became strained in 2012 when she filmed a reality show Mrs. Eastwood and Company, and when she announced their separation in August 2013 she indicated they had already been separated for some time. Clint Eastwood's divorce from Dina Ruiz was finalized in December 2014.